Product innovation, technological advancements, and maintaining quality standard are the key strategies adopted by players to maintain a stronghold in the global in-car entertainment and information system market. As per the findings of a Transparency Market Research (TMR) report, the top four companies held over 31.6% of the market in 2014. The market therefore demonstrates a fragmented vendor landscape since no single player enjoys the lion’s share. 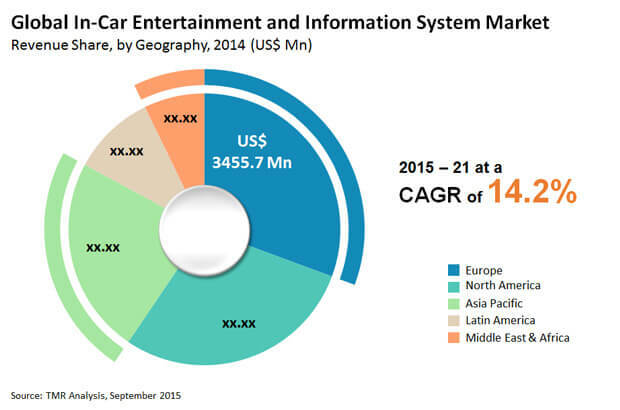 The global in-car entertainment and information system market stood at US$11.42 bn in 2014. Rising at an impressive 14.2% CAGR, TMR expects the market to reach US$28.64 bn by the end of 2021. Innovation of the latest technologies has resulted in considerable growth of the in-car entertainment and information system market. A paradigm shift in consumer preference from a basic driving experience to more advanced infotainment solutions augur well for the market. “As the automotive industry continues expanding, the demand for in-car entertainment and infotainment system will rise in response,” states a lead TMR analyst. “Among the infotainment solutions deployed in the latest versions of cars, WiFi and Bluetooth, navigation, audio-video solutions, and telematics are among the technologies currently attracting a lot of interest,” he added. Besides this, the increasing vehicle production across Asia Pacific, Latin America, and the Middle East and Africa (MEA) is expected to fuel demand for in-car entertainment and information systems. Positive growth witnessed in developing countries across these regions, coupled with rising purchasing power of consumers, is poised to augment automobile sales, thus boost in-car entertainment and information systems sales across emerging economies. Stringent regulatory requirements have emerged as a bottleneck for in-car entertainment and information system manufacturers. Several original equipment manufacturers (OEM) are finding it difficult to comply with the strict standards implemented by governments across various countries. Regulations governing the automotive industry have not only translated into high production cost of vehicles but is also negatively effective the consumer demand. Besides this, the high research and development expenditure is also deterring several small players in the market from investing further. Developing advanced infotainment solutions requires state-of-the-art manufacturing facilities with modern devices that come at a high cost. Additionally, ever changing technologies in car entertainment and information solutions also dampen the growth of several manufacturers. According to TMR, the rising demand from countries in Latin America, Asia Pacific, and MEA will create growth opportunities for in-car entertainment and information system manufacturers in the near future. The rising purchasing power of consumers across countries such India, South Africa, China, Saudi Arabia, Russia, and Brazil will also fuel demand from the market in the forthcoming years. By application, the entertainment sector has been exhibiting the high demand for in-car entertainment and information systems. In 2014, it held a dominant share of 39.3% in the global market, followed by telematics and navigation segments. Regionally, Europe dominated the global in-car entertainment and information system market in 2014. Europe boasts robust developments in the field of entertainment, which, as per TMR, will enable the region’s in-car entertainment and information systems market to reach US$8.5 bn by the end of 2021. Driven by sustained technological developments, Europe in-car entertainment and information system market to reach US$8.5 bn by 2021. Holding over 39.3% of the market in 2014, the entertainment sector emerged as a key application segment in 2014. Demand for in-car entertainment and information systems to rise in response to increasing demand for automobiles.